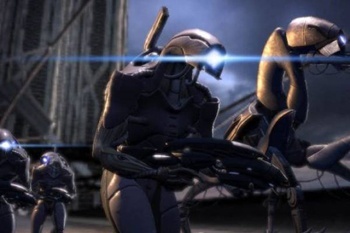 BioWare has released the system specs for the PC version of Mass Effect 2, handy information for fans wondering if a system upgrade is looming in their near future. There are two kinds of PC gamers out there. There are guys like me, who want a game, preorder it and then if it turns out that we can't actually run the thing, upgrade our PCs accordingly without a second thought. (We're generally the same guys who plead poor when it comes to things like food, clothing, paying the rent, etc.) And then there are the folks who pay attention to system specs because their computers are a few years old but they're still running fine and they don't want to waste money on a game they can't play. Video Card = 256 MB (with Pixel Shader 3.0 support). Supported Chipsets: NVIDIA GeForce 6800 or greater; ATI Radeon X1600 Pro or greater. Please note that NVIDIA GeForce 7300, 8100, 8200, 8300, 8400, and 9300; ATI Radeon HD3200, and HD4350 are below minimum system requirements. And for those concerned about intrusive DRM, BioWare Community Coordinator Chris Priestly also noted that copy protection will be minimal. "The boxed/retail PC version of Mass Effect 2 will use only a basic disk check and it will not require online authentication," he wrote on BioWare's Mass Effect 2 forum. "This is the same method as Dragon Age: Origins. Digital versions will use the retailers protection system."